Judith Jesch, Professor of Viking Studies at the University of Nottingham discusses viking women, warriors and Valkyries. I … made the Valkyries bring wine, as a prince was coming. from the human world; my heart is glad! The BP exhibition Vikings: life and legend promises to reveal ‘a world of warriors, seafarers and conquerors’ and its iconic image is a sword. As that suggests, much of this world is a male world, and this chimes with popular perceptions of the Vikings as large, aggressive and bearded men. A more nuanced view of the Viking Age would recognise that even large, aggressive and bearded men had mothers, and very likely sisters, wives and daughters, and if you look closely at the exhibition you will find some personal items associated with such women. Nor did these women all stay at home while their menfolk went out into the wide world of raiding and trading. There is evidence for female traders in Russia, for instance, for far-travelling women, for queens and mistresses of large estates, as well as for women as victims and slaves. Also, women were an absolute prerequisite for the lasting establishment of a successful new nation in the uninhabited island of Iceland. Women can boast of many achievements in the Viking Age yet, in a quarter of a century of studying them, I find that the one thing I get asked about most often is the one thing I do not think they ‘achieved’, which was to become warriors. 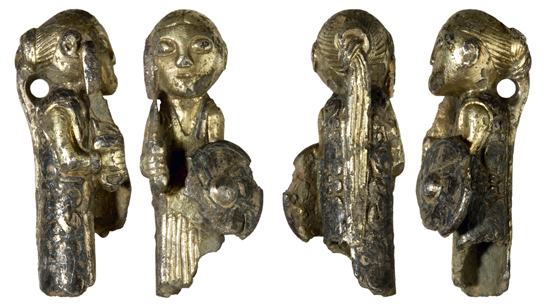 A very small silver figurine, found in Hårby, in Denmark, in late 2012, may seem to contradict this. It undoubtedly represents a woman: she has the knotted pony-tail and long garment characteristic of many other representations of female figures in Viking art. What is unusual is that she is carrying an upright sword in her right hand and a shield in her left. The function of this figurine is unknown, and what it represents is also mysterious. If it is intended as an image of a woman warrior, then it is not a realistic one. Her garment is elaborate and beautifully decorated, and would be a real hindrance in combat, as would her uncovered head and its pony-tail. Male warriors did not always have helmets, as these were expensive, but would have had some kind of protective headgear like a leather cap. So we are left to conclude that the figure must be symbolic, rather than realistic, and most experts are inclined to label her as a valkyrie. Valkyries are interesting and significant figures in the warrior cultures of the Viking Age. We know about them mainly from Old Norse literature, the poetry and prose written down in Iceland in the thirteenth century and later. The medieval Icelanders understood the function of valkyries literally from their name (valkyrja means ‘chooser of the slain’), and presented an image of them as handmaidens of the war-god Odin. He would send them to battle to choose those warriors who were worthy of dying and going to Valhalla, the hall of the slain, where they prepared themselves for the final battle of Ragnarok. There, the valkyries acted as hostesses, welcoming the dead warriors and serving them drink, as in the anonymous poem about Eirik Bloodaxe cited above. This literary understanding is confirmed by many Viking Age images of female figures, with long hair and gown, rather like the Hårby figurine, but holding out a drinking horn. When carrying out their duties on the battlefield, however, valkyries needed to be armed and the literary texts suggest that they were usually equipped with helmets, mail-coats and spears. Any association between valkyries and swords, on the other hand, is very rare as a sword, closely associated with masculinity, would be incongruous on a female figure. The sword was the weapon of choice, the prized possession and the status symbol of the better sort of Viking warrior. Many men, not all of them necessarily professional warriors, were buried with their swords, although they would also have an array of other weapons, like the man in the Kaupang burial, or the helmeted warrior depicted on the Middleton cross from North Yorkshire. The undoubted successes of the Vikings in warfare and conquest were rooted in a well-developed Odinic ideology that sustained and strengthened them through their campaigns. The myth of Valhalla, the idea of death as a reward for the successful warrior, mediated by a female figure, is a powerful part of this ideology. It provided the warrior going into battle with an incentive and the dying warrior with a kind of consolation. Some of the literary texts develop this idea in a romantic way by telling of love affairs between warriors and valkyries though these, too, generally end in death. This martial ideology of which valkyries are a part also seeped into daily life. A typical valkyrie name, like Hild, means ‘battle’, and many ordinary women in the Viking Age also bore names (Iike the very common Gunnhild, or ‘War-battle’) that contained such elements. Yet that did not make them women warriors. Like most periods of human history, the Viking Age was not free from conflict, and war always impacts on all members of a society. It is likely that there were occasions when women had to defend themselves and their families as best they could, with whatever weapons were to hand. But there is absolutely no hard evidence that women trained or served as regular warriors in the Viking Age. Valkyries were an object of the imagination, creatures of fantasy rooted in the experience of male warriors. War was certainly a part of Viking life, but women warriors must be classed as Viking legend. Professor Judith Jesch is the author of Viking Poetry of Love and War and one of the presenters of Vikings Live, at cinemas around the UK on 24 April. The BP exhibition Vikings: life and legend is at the British Museum until 22 June 2014.